Safety, Performance and Reliability have long been the key drivers in Supershear’s product development for handpieces. All our handpieces have been specifically designed to withstand the toughest of conditions to ensure years of trouble-free shearing. Manufactured from the highest quality material available, Supershear handpieces are built using the latest technology to ensure world-class performance. We intensively researched what shape the next generation shearing handpiece would take; from that research the tough, modern Viper was born. This smooth, racy handpiece is the result of faultless engineering combined with expert knowledge from some of the most accomplished shearers that have ever walked the boards. 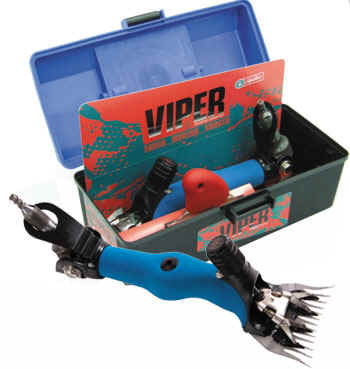 Featuring a slim-line handle, the Viper is perfectly weighted and supplies an endless, powerful, and smooth cut in all conditions. Fused with a new back joint guard to help prevent uncomfortable rubbing, and an improved back joint seal to provide a tight barrier against dust and dirt, the Viper will supply consistent satisfaction to every serious shearer. Supershear’s all NEW Viper Handpiece. Feel the difference.